I thought I do a little introduction about myself! My real name is Liz and I usually go by Yamichan16/Yami on the internet. I'm 23 years old and I just graduated from college with a degree in Environmental Health. Currently job seeking. D: Anyway! I am silly girl who loves to have fun! Usually I'm always happy and smile. I enjoy reading, writing, hiking, swimming, roleplaying, and playing video games. I am a HGTV and Foodnetwork junkie. I also love to watch anime, but not like I use to. I tend to keep short anime series, but I am willing to watch a longer anime if it's worth it. As for Sailor Moon! Like most US fans I found out about SM by watching the dub as a kid. I fell in love with SM instantly and would pretend to play as the characters in my backyard. 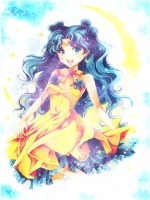 I even made up a Sailor Earth. XD As the years went on I discovered the Japanese version in high school. I new it was different from the English dub from websites discovered in grade school, but I never got a chance to watch it. Thanks youtube I was able to see the awesomeness of the Japanese version! It made me love Sailor Moon even more! Then after that I read the manga online (or at least tried too) and discovered Sailor V manga. It took me years to finish these manga series because I was having a hard time finding a good source. So yeah! I love SM! Sailor Venus is my favorite and Sailor V is my favorite version of her! Hence why I picked Sailor V to be my staff username. Thats another thing about me! I love hugs!! And I like giving hugs! Subject: Re: Sailor V here! !